Almost all attractions close on Christmas Day. On other holidays some attractions open, often with reduced hours. You can ask for 'Cashback' when making purchases with a debit card at supermarkets. Visa and Access (Mastercard) widely accepted, other cards often accepted. Banking hours officially 09:30-15:30, but most banks open usually till about 17:00. Most banks and major post offices will be able to change money for you. And in the larger cities you will find bureau de change offices, usually in places like train stations or travel agencies. For cash withdrawals on a visa card, you will need to produce your passport. Cheques accepted everywhere - though a valid cheque card must be produced. Tourist cheques can be paid into British banks, but will be subject to a fee. Commission rates and fees vary from one bureau de change to another. In major cities like London charges can often be extortionate. Check the rates and fees before you change your money, and remember that it may be worthwhile to shop around. American English often differs from British English. Our list of often confused words is here. Why is American English different from British English? England's weather remains the most frequent topic of conversation. Although England does have a reputation for wet weather all year round, it doesn't rain every day all year around. However it is impossible to guarantee good or bad weather in any given month - so be prepared for anything. Find out more about our weather here. The summer months are when mosts Brits take their holidays, with schools breaking up for the whole of August. The summer months have the best weather but crowds at tourist attractions tend to peak around June-September. From March until May spring will have arrived, there is a good chance of fine weather. Some tourist attraction don't open until Easter weekend. June through to September is the peak summer period. Gardens will be in full bloom, the evenings long and the warm days just right for wandering around. October and November are the months when autumn sets in. The leaves on the trees change to all shades of brown and orange. December through to February is the winter period. The British are said to be reserved in manners, dress and speech. We are famous for our politeness, self-discipline and especially for our sense of humour. The traditional red phone boxes are now rare; instead kiosks come in a wide variety of designs and colours. 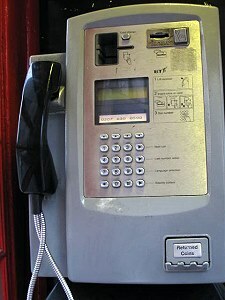 Coin-operated phones take Most payphones accept 10p, 20p, 50p & £1 coins, but card-operated phones are often more convenient. British Telecom phone cards are available in most newsagents or grocers. Calls from hotels are expensive. Dialling codes: The UK international dialling code is +44 and the area code for London is (0)20. We now have Internet as well as normal telephone boxes in London. 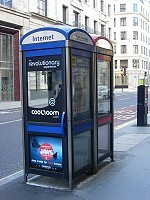 The photo above shows a blue internet phone box with a red 'normal' phone box behind. The minimum fee is 40p (forty pence). Local and National calls are charged at 40p for the first 20 minutes, then 10p for each subsequent 10 minutes or portion thereof. To make a call using a Credit/Debit Card, swipe the card through the card reader on the phone and follow the instructions. Call prices - 20p per minute. Minimum fee £1.20 (includes £1 connection charge) for Local and National calls. The minimum fee is £1.20 (includes £1 connection charge. Pre-paid phone cards can be bought from selected newsagents, off licenses and convenience stores or internet cafes. 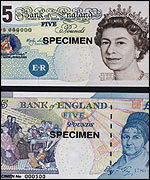 They are sold in denominations of £5, £10, £15 and £20. The card will be pre-charged to the value shown on the card face. Post offices are open Mon-Fri 9-5:30, Sat 9-1. 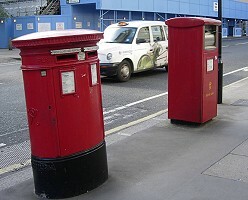 A first class letter posted by 18:00, should arrive the next morning within the UK - check the 'last posting times' on the red postboxes. Stamps can be bought individually at post offices or in books of four or ten at newsagents, off-licences and groceries. General opening hours for shops are 09:00 - 05.30 (9am - 5:30pm) Monday-Saturday. However, in the larger towns you will probably find shops open late some evenings (usually Thursday or Friday). On Sunday shops open from about 11:00-17:00 in the major shopping areas. Supermarkets tend to be open 7 days a week with longer opening hours - usually until 8pm or 10pm most evenings, with reduced hours of 10am - 4pm on a Sunday. Some in larger towns now open 24 hours, but it is worth checking first. The power supply in Britain is 230/240 volts. Sockets accept only three-(square)-pin plugs, so an adapter is needed for continental European and US appliances. A transformer is also needed for appliances operating on 110-120 volts. Most hotel bills include a service charge, usually 10-12%. Where a service charge is not included in a hotel restaurant, it is customary to give 10-15% of the restaurant bill and for rooms an optional amount to room staff. Some restaurant bills include a service charge; where a service charge is not included it is customary to leave a tip of 10-15% of the bill. Some restaurants now include a suggested tip in the bill total. 75p - £1 per suitcase. By Rail: The National Rail website allows you to plan your journey and will keep you up to date on service alterations. This site will also enable you to check prices and purchase your train tickets online. Greenwich, in London, is where you will find the Prime Meridian - the line that divides the Earth into East and West and from which the world's time is set. Greenwich Mean Time (GMT) is the term used for the current time on this line, and clocks and watches all the world over are set in relation to this. Britain and Ireland in theory follow GMT, but in the summer months everything is confused by what is called Daylight-saving time. From late March to late October, Britain and Ireland are actually one hour ahead of GMT. What time is it in England now? In the UK public conveniences are referred to by a number of names. The most common names heard in the street are 'toilet; and 'ladies and gents'. We don't use the word bathroom for toilet. The word bathroom to us means a room with a bath. Nor do we use the word restroom. If you do ask for a restroom people will just look confused. Public conveniences can be found in most rail stations and larger bus terminals. You can also find them in town centres, department stores, shopping arcades, supermarkets, and at all major tourist attractions. Most towns will have a map in the central area with public conveniences marked on them. The vast majority of public toilets are free, although in major tourist areas such as London you will probably have to pay about 20 pence. The UK currently uses a mix of metric and non-metric units for different purposes. Distance on roads are measured in miles and yards, drinks are poured in pints, but generally the metric system is used elsewhere. When you go to the supermarket, you will probably find all weights, volumes, etc. in metric units, e.g. can of beans with 400 g on the side, bag of pasta with 500 g on the packet, bag of frozen chips with 1.8 kg on the packet, bottle of water labelled as 2 litres. Petrol and diesel fuel has been sold in litres for many years. Weather forecasting the UK is typically done using the metric units of temperature, degrees Celsius.